For the last four months I've been fussing over foundations, playing around with coverage, shades, blendability, thickness, liquids, sticks, powders, CC, BB, DD and EE (etc.) creams. I have amassed a large selection of foundations in the process, but I've found 3 needles in the haystack for everyday wear that don't break me out, are neither too pink, or too orange and have a finish I'm rather fond of. It Cosmetics Your Skin But Better CC Cream £30.00 Destined to earn cult stardom It Cosmetics CC Cream gives one hella' glow. 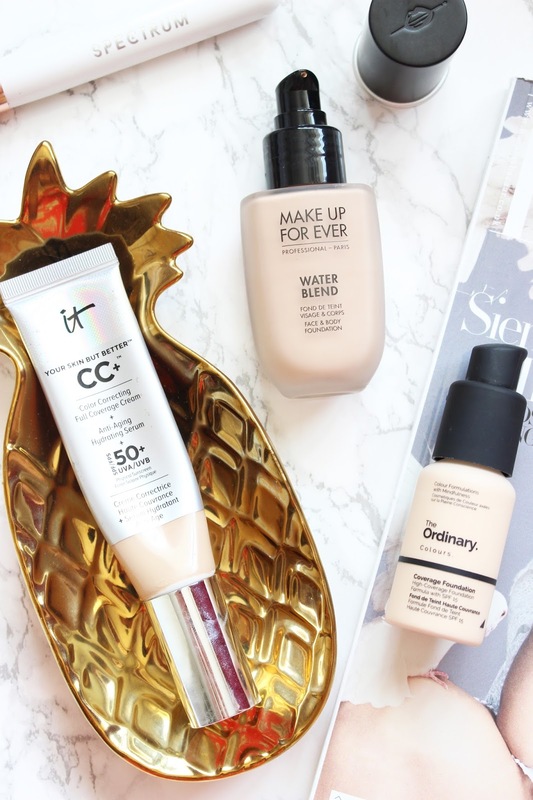 Sitting somewhere between a foundation and a skincare product, It Cosmetics Your Skin But Better CC Cream gives the coverage of a foundation with the power of a serum. Its superstar ingredients include hydrolyzed collagen, hyaluronic acid, antioxidants and vitamins A, B, C and E and it has a legit SPF of 50! Buffed into the skin it feels like moisturiser (it actually feels good for your skin) and the coverage is pretty decent, helping to disguise my blotchy complexion. The tube states its full coverage, I put it at medium, but it doesn't crease, cake or crack and it's seriously glow-inducing, melty, dewy, your skin but better. It does eventually dry down to a smooth satin finish. And usually long lasting and dewy don't go hand-in-hand, but I find it lasts pretty darn well. Not one for those with oily skin, but those of you with dry skin will love the hydration and radiance it gives. It's for sure a mainstay in my top Muiji drawer and a beauty base I highly recommend. Make Up For Ever Water Blend Face & Body Foundation £27.00 Make Up For Ever Water Blend Face & Body Foundation is a marmite product. But I love it. A foundation for people who like fingers, slap-on sheer, no fuss foundation. Make Up For Ever Water Blend has a super sheer, surprisingly buildable coverage. It's kinda like magic, blurring imperfections, neutralising redness all without wearing much makeup. I prefer to stipple the liquid-y formula into my skin and finish with a buffing brush. Once applied it provides a radiant, lightweight, fresh-faced finish. Because it's water-based (80%) it's extra hydrating so doesn't cake on my skin by midday, but due to it's sheer coverage it's barely there by the late afternoon and when my skin is shite the coverage doesn't cut the mustard and concealer is required. However, for me this foundation is a no makeup makeup dream, keeping my skin looking and feeling skin-like. The Ordinary Coverage Foundation £5.90 Yup, I've managed to get my hands on the foundation that amassed a 25,000 person waitlist and yup, I know what you want to ask; is it worth the hype? The Ordinary Coverage Foundation is a highly concentrated medium to buildable coverage foundation. When it comes to beauty bases typically speaking I don't like a super heavy finish, but I do need something that will neutralise redness. The Ordinary Coverage Foundation manages to make skin look flawless and is both light and hydrating - best of both worlds. It doesn't boast that super real-skin effect like the Make Up For Ever Water Blend Face & Body Foundation, but it does leave my skin looking healthy. And although it has a semi-matte finish I find when applied over my Estée Lauder DayWear Creme, not only does it glide on smoothly, it still has a slight dew. Its biggest drawback? It transfers. But that's nothing a light dusting of powder can't fix. And did I mention it's travel friendly, comes with a pump and is available in 21 shades?! Impressive stuff and an absolute bargain and The Ordinary is now available at Cult Beauty. What beauty base are you currently loving?